Monday--softball. We won this game. I can in as a pinch runner in the second to last inning. And then in the last inning I ran home from my own hit (from the batter after me) and then again as pinch runner. So I got a lot of running in. Another busy week! Softball on Monday, training run on Tuesday, Dance Trance on Wednesday and Miracle Miles 15k on Saturday! I was supposed to do a training run on Thursday but I have a bruise down the inside of my shin bone that I have no idea where it came from and I'm hoping its not a running injury so I sat it out. Monday--softball. We lost in a close game in the last inning. I batted pretty well. I was afraid of hitting since I struck out 3 times the week before (NEVER done that! I have no idea what my problem was!) But this time I hit pretty well and hit one to the outfield (just barely but I'll take it) so that was good. Wednesday--Dance Trance class. This was a class I'd been wanting to try for a while and I really enjoyed it! I miss dancing days. I can't commit to a monthly schedule so I was going to buy a 10 class pass for $100 but I found a Groupon for $20! I'm looking forward to more dancing! Thursday--skipped my training run due to bruise--hoping its not a running injury. Some of the YelpSisterhood decided to visit several restaurants for Visit Orlando's Magical Dining Month. The first of these restaurants was Hemingway's, which is located in the Hyatt Regency Grand Cypress. Most of us had been there before for a Yelp event the previous year. In fact, that was where we met Meghan for the first time! The menu looked delicious, so we were all excited to dine there again. First up, the matter of drinks! I'd tried the Papa Doble during the Yelp event and loved it so much that I ordered it again. I briefly checked out the menu, but I already knew what I wanted. Florida Rock Shrimp Chowder which is Zellwood sweet corn, diced potato, cracked black pepper, crispy potato. MMM! So good! I only wish there had been more shrimp in it. For dessert, I was one of the few who didn't order the Key Lime Pie (I don't like tart things). Hemingways was such a great choice! If you love seafood, I definitely suggest it! Sooo..funny story. My friends and I have made several reservations this month to check out a few Magical Dining menus. I gave a list of ones I'd be interested and we decided on Deep Blu at the Wyndham Grand Hotel. Fast forward a few weeks and it's my birthday. I always make Kory surprise me with where we're going to dinner. And where did he pick this time? Deep Blu! Does the boy know me or what?? When we sat down, the place was EMPTY! There was a small section in the back where I saw two tables filled. But in our main dining room, we were the only table until almost the end of our dinner! It was really pretty inside and random, but we both kept commenting on how comfy the chairs were! When the waitress put our menu down, I noticed a nice surprise at the top. We decided to stick to the Magical Dining Month menu. Although when I looked at the menu, I saw some oysters as appetizers. I asked our waitress, Shannon, if they could steam them and she said no. No biggie. Since I'd be coming back later in the month, I'd just wait until then and have some raw ones as an appetizer. We placed our drink orders. I got the St. Augustine. It was perfectly sweet. The bread was okay. It looked like it was garlic butter and there were cloves of garlic in the butter, but it wasn't strong enough. I'm not a huge fan of bread unless it, or the butter is flavored, so I took a bite and passed. About this time, Shannon came back and said that she had gone ahead and asked the Chef about steaming the oysters. He said that since they were empty, he had time to go ahead and do that for me! Talk about great customer service on both Shannon and the Chef's part! Shannon could have just said no and left it at that! But instead, she went out of her way since she knew I wanted them. And then the Chef could have said no too! So I was a very happy girl! For the appetizer, I got the Butternut Squash Bisque which had Vanilla chantilly and crisp miniature greens . It came in this fun, tall bowl (you can't tell in my awful-picture taking skills.) The bisque was very flavorful. And it was really thick--much thicker than other bisques I've had. Kory got the My Yard Farms Kale Salad which had goat cheese, pears, strawberries, carrots, candied pecans, pork belly & warm grain mustard vinaigrette. It was yummy too and I kept stealing his cheese pieces! For the main entree, I ordered the Blu Crab Risotto which was creamy risotto with lump blu crab, asparagus puree & topped with miniature local greens. It was delicious! The presentation was unusual, instead of being in a bowl or regular plate, and I enjoyed that! Kory had the Seared Florida Red Snapper which was Florida gulf coast red snapper served with a whipped Yukon gold potato, tropical fruit relish of pineapple, honeydew, cantaloupe & cilantro. I tried a bite but liked mine much more. Kory disagreed and devoured his! For dessert, we both ordered the Florida Citrus Creme Brulee but Shannon came back with a surprise--a fun birthday dessert! There was banana cheesecake, espresso creme brulee and a deconstructed s'mores dessert with flourless chocolate cake, toasted marshmallows and graham cracker crumbs. OH MY! This dessert was so right up my alley! I would have ordered each one separately if I had seen it on a menu. If I see anything banana-y or creme brulee, that's what I make a beeline for. And then I love inventive desserts which is what the s'mores dessert was. My favorite was the s'mores dessert. The chocolate was just decadent and the marshmallows complemented it so well. The banana cheesecake was quite tasty too! The espresso creme brulee was good but reaallllly heavy on the coffee taste. I love Magical Dining month! You get to venture out to restaurants and try foods you might normally get to try. And honestly, before we ate, I wasn't sure if I was going to go back with my friends later in the month or skip it now that I had done it. But after my meal there, I'll be going back! There's other items on the menu that I can't wait to try! Today is my 34th birthday! I was actually born on Labor Day and my mom loves to joke about how she was in labor on Labor Day! 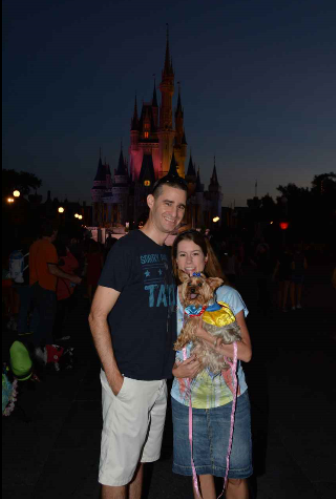 The weekend festivities started off on Saturday with being able to take Bella into the Magic Kingdom for the Disney Parks Blog Disney Side Dog's Day at Magic Kingdom Park! It was an incredible and fun experience! Saturday night was supposed to be spent enjoying a Gator win but the game got delayed twice due to storms and then finally cancelled. So sad! I'm ready for the Gator football season to start! On Sunday, I got up and got a run in. Then on Sunday night I headed out for a girl's night of fun. I met up with Meghan (Meghan on the Move), Cecille, Carla, and Cindy at Big River Grille & Brewing Works for dinner. I had a yummy steak. I also tried the pineapple mojito. It was good!! Meghan and I had to get one of our traditional pics. Speaking of those pics...Meghan made me a scrapbook of all of our pictures! I loved it! For dessert, Cecille brought cupcakes from Blue Bird Bake Shop. I stole the chocolate one. We took a group shot outside. Then said goodbye to Carla and Cindy. Meanwhile, Cecille, Meghan, and I headed to one of my most favoritest places! JELLYROLLS! I was so excited to be introducing them to this great place. As I was there last night, I realized so much of my life has happened there. That's where Kory and I met for the first time. We've spent numerous nights there with friends and family, Kory's brother worked there, we spent New Year's Eve there one time, and my parents even threw me my 30th surprise birthday party there. So I was glad that the girls were up for going. And yup--we needed one of our pics. We stayed until just after midnight--just long enough so that I could say I was there on my birthday! Then we headed home. It was a great way to kick off my birthday day! This morning I slept in then Kory and I headed to Firehouse Subs for my birthday lunch. I got my classic Hook & Ladder. My fav! Then we went over to Downtown Disney to see the movie If I Stay. I'd been wanting to see it and it's not up Kory's alley but he decided to take me since it was my birthday and all. It was so good but soooo sad! We went back home for a little while and I opened some birthday presents. I'd been needing a new Chi and my mom got me this pretty breast cancer awareness one. And then we changed to head back out to dinner. He surprised me with dinner at Deep Blu. I've been wanting to eat there for a while so I was excited! It was delicious! I'll be posting a full review on it coming up this week! Then we headed over to Hollywood Studios. I'd been wanting to see the Frozen Fireworks so indulged me. Unfortunately, I did not pick a good spot to watch the fireworks. Sigh. But I still loved the show! I had such a wonderful birthday!